Both the leaders stressed that terrorism cannot be associated with any religion or belief. 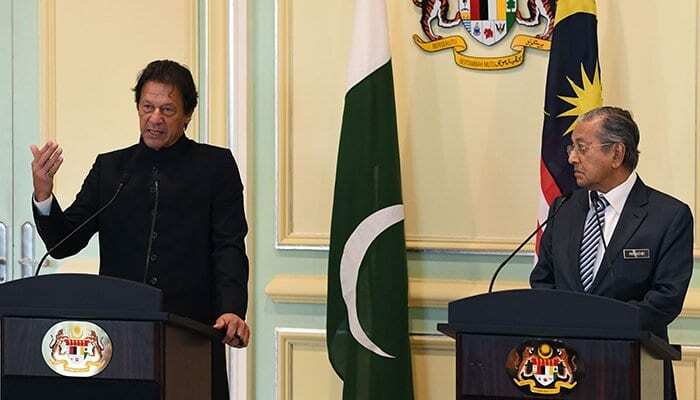 Prime Minister Imran Khan on Wednesday told Dr Mahathir Mohamad that Pakistan wants to learn from Malaysia and its leadership. The premier said he wanted to visit Malaysia as he admires Dr Mahathir and what he has done for his country. “One of the main reasons I wanted to lead to the Pakistani delegation to Malaysia was out of admiration for PM Mahathir. We look upon you as a statesman and someone who transformed his country,” the premier said. Pakistan invited potential Malaysian companies to explore the possibility of investing in Special Economic Zones to take advantage of Pakistan’s strategic location at the crossroads of Central, South and West Asia. In a joint statement released, the two leaders agreed to increase their collaborative efforts to uphold the true values of Islam in international fora while strengthening the solidarity of the Muslim Ummah. Both sides reaffirmed their commitment to collaborate more closely on issues affecting the Muslim world, including taking joint efforts in underscoring Muslim sensitivities in attacking Muslim holy personalities and religious beliefs, the statement read. Further, both the leaders stressed that terrorism cannot be associated with any religion or belief. The Malaysian side took note of the massive counter-terrorism efforts that Pakistan has successfully undertaken in an effort to eliminate terrorism, it added.